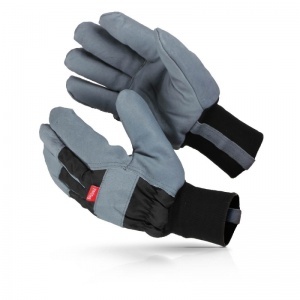 Manufactured to the highest of standards, the Flexitog Sherpa Fleece-Lined Freezer Gloves FG610 provide exceptional protection from the cold while preventing cuts and scrapes with their artery guards and knuckle guards. They are fleece lined which enhances warmth, while an special elasticated wrist is designed to fit most users and prevent cold draughts from entering the gloves. When working in freezing cold and hazardous conditions one thing you need is quality, and that is guaranteed with the Flexitog Sherpa Freezer Gloves. A wing thumb design enhances durability, a taslan back offers high flexibility and dual stitching protects the hands from mechanical threats, all of which make the gloves a durable, safe and high quality choice. The Flexitog Sherpa Gloves are available in one size that should be suitable for most users because of the adjustable strap. To find your perfect pair, please measure the circumference of your palm and match the results to the table below.